A lot of iPhone X series smartphone users are facing a weird iPhone Activation Error. If you are one among them, read the article to find possible methods to activate iPhone without any error. Not just the iPhone X series, but also other models are facing these issues, too. Some error messages like “iTunes was unable to verify your device”, “iPhone could not be activated, the activation server is temporarily unavailable”, “iPhone is not recognized and cannot be activated for service” pops up, and now you are wondering how to fix this issue, Read on. Majority of users who are facing iPhone Activation Error are on Verizon and AT&T customers. Customers are asked to wait for longer periods of time and end up getting some sort of error messages like given above. Some users are lucky enough and after waiting for some time, the device gets activated easily. But, some people are not able to activate iPhone due to the congestion issue. Millions of devices are activated continuously and sometimes the system will go down, resulting in iPhone Activation errors. Now, you got a basic idea on what might be the reason behind the activation issues. You are not alone, thousands of other iPhone users face this issue, too. If you are one among them, Don’t worry. In this article, you will find multiple methods to fix iPhone Activation Issue and get your iPhone activated straight away. Here are the common error messages that most users get while activating their iPhone for first-time use. I will be sharing different methods based on different case scenarios. Try one by one and hopefully at least one should get it right. 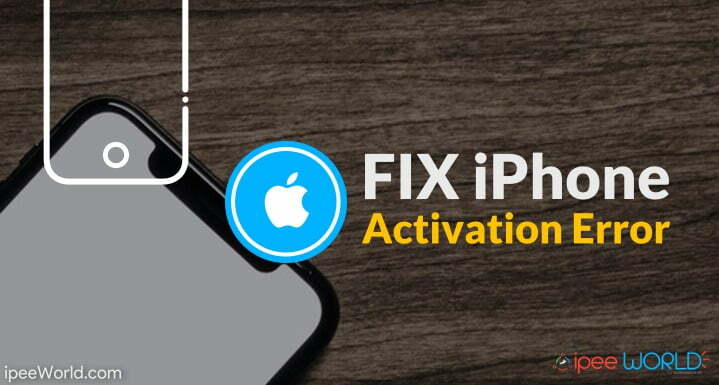 Most of the time, iPhone Activation Error occurs due to Server hand or lag issues. That means, at certain times, a lot of iPhone gets activated at the same time. In this case, the server may not be able to process all the requests accordingly. This is temporary, you can try after some time. If server load is the reason why you can’t activate your iPhone then you should wait for some time and try again. Once the server manages the load, you can try once again and see if it works this time. If it doesn’t work for you then you should try some other methods mentioned below. Once, your device is completely turned off, press and hold the side button again and turn on the device. After a successful restart, try to Activate your device again, and see if this method works for you. gs.apple.com is a subdomain that should be accessed while going through the activation process. If the WiFi or Ithe Internet Connection that you are connected to is blocking the particular subdomain or Apple and associated ports then this is definitely going to be an issue. To fix this, first, check your WiFi block page settings and see what websites are blocked by your Network. If you are not able to see the blocked sites and services of your WiFi Network then the best thing you can do to get things done is to connect to a different WiFi connection. Go to WiFi settings, and switch to a different WiFi connection and now try to activate your Device. Hope this will help you to activate your iPhone. If you are trying to activate iPhone with a different carrier on a locked iPhone then it won’t work for sure. If you try to activate a locked iPhone with a different carrier provider then things won’t work at all. You can call your carrier service provider and ask them to activate your iPhone and SIM. Their executive should guide you through the activation process and things should be ok. If you are trying to switch the carrier, tell the same to their executive support team and they will guide you through the migration process as well. In this method, we will try to restore iPhone. It is same as resetting an Android Device. But, you will need iTunes this time. Just connect your iPhone to a computer via cable and then download and open iTunes in your computer. Go through the initial setup and restore iPhone within the iTunes interface. Hopefully, this should work. In this method, we will try to activate iPhone via Apple iTunes. For this, first, you should connect your iPhone to a computer with the cable that comes with the box. If iTunes, is already installed on your computer a popup should appear. if that doesn’t happen then manually launch iTunes. Wait for iTunes to detect your new iPhone and now it will ask whether to activate it or restore. Select Activate and go through the initial Setup process. If an error in iTunes says that the SIM card isn’t compatible, contact your carrier. If none of the methods works for you and you are not able to activate your iPhone, then all you have to do is contact your Carrier or pay a visit to your nearest Apple Store. They will check your device and help you in getting your device activated. You can also contact Apple Support team and let them know your issue. These are some of the best working methods fix iPhone Activation problem and activate your iPhone right away. You can try every method mentioned above until you find the right option for your device. Most of the time, the activation problem occur due to unbalanced server load(a huge number of iPhones are activated at the same time) If this is the problem then you should be able to activate iPhone after some time. If that doesn’t get it right for you then go through the article and try every single option mentioned in the article and get your iPhone activated ASAP.